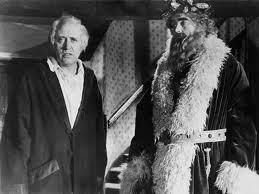 Alastair Sim in the title role of the 1951 film "Scrooge"
This tale, published in 1843, reputedly changed the way Christmas was observed in Great Britain and the United States. Apparently Christmas had become an impersonal, institutional event. 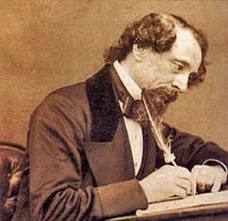 Dickens believed it should be centered more on the family and the home and should inspire feelings of affection and generosity. 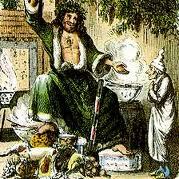 The themes in “A Christmas Carol” touched folks in exactly that way and permanently altered the way they marked the day. Dickens was not religious in the conventional sense; in fact, he famously rejected organized religion in general and religious dogma in particular and repeatedly lampooned the clergy and their preaching. Still, he held Jesus in high regard and subscribed to what he construed to be Jesus’ central message: Love one another. 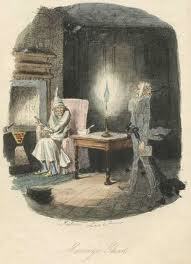 Ebenezer Scrooge is confronted by the ghost of his business partner, Jacob Marley. Dickens had experienced a powerful dose of inhumanity as he grew up in impoverished and humiliating circumstances, and he went out of his way as an adult to witness the suffering of those whom the industrial revolution had left without hope of a decent, dignified life. 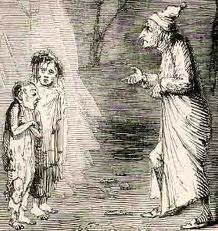 His reaction to what he saw is often obscured in the popular images of the characters Dickens created. When Dickens was 12, his father was sent to debtor’s prison — an event memorialized by the experience of Wilkins Macawber in “David Copperfield.” Dickens had to work 10-hour days under atrocious conditions pasting labels on bottles of boot blacking — and that was also recreated by the boy Copperfield in the novel. 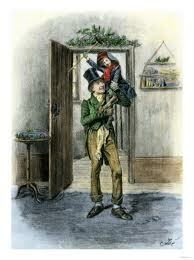 The fact that not only Dickens but many other children were treated so badly infuriated Dickens. He wrote about such abuse in “Oliver Twist,” but the anger with which he wrote is hardly evident in such echoes as the musical “Oliver!” And as charming as “A Christmas Carol” can be, it is darkened again and again by Dickens’ flaring temper. This indignation drives these stories, but it often gets left behind when the text is reinterpreted for the stage or the screen. 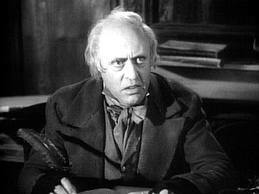 “Have they no refuge or resource?” Scrooge asks.